The Barn at Barford Farm House is located in the village of Medstead on the north west boundary of the South Downs and at almost 700 feet above sea level enjoys panoramic views south and west towards Winchester. Escape from all the hustle and bustle of the daily grind and relax and unwind in this highly regarded rural retreat set within some of Hampshire's finest countryside. Furnished to the highest standards throughout, The Barn is suitable for couples or single family occupancy (1 double bed and 1 double sofa bed in living area). Further details and photographs of the accommodation can be found on our website. Dog and children friendly! Enjoy a drink or dine al fresco and listen to the hum of insects, or watch the aerobatics of a profusion of butterflies which enjoy the scented herb beds along the terrace and in the gardens. Watch gliders as they ride the thermals and make their way back to the local airfield at Lasham. 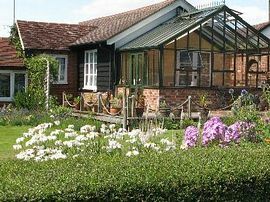 Sit in the comfort of the Garden Room and enjoy the views across the gardens and over the paddocks to the woods beyond. Indulge in one of the many varied titles available from The Barn's own library. Chill out watching DVD's on one of two players available at The Barn, choosing from a good range of titles, or simply watch TV with the added benefit of Freeview. Enjoy the sight and perfume of an abundance of bluebells found in Hook Wood in Spring. Work up an appetite cycling along Route 23 or stroll along the particularly good local network of footpaths, with some renowned pubs en route. Several chalk stream walks are well within reach, as are The South Downs and New Forest. Local maps and other literature are available to help you plan your route. Experience a new sport. Try horse riding, fly-fishing, clay shooting, gliding or golf which are all available locally, though some might require advanced booking. Visit Jane Austen's Chawton (10 minutes), the steam trains on the Watercress Line (10 minutes), the picturesque Georgian market town of Alresford (10 minutes) or visit the varied shops and museums to be found in the historic market town of Alton (10 minutes). Visit National Trust properties including Hinton Ampner (20 minutes), The Vyne (30 minutes) and Mottisfont (40 minutes). Visit the historic cathedral cities of Winchester (20 minutes), Salisbury (50 minutes) or Chichester and Wells. Research your personal schedule via Broadband. Just a few ideas whilst staying at The Barn! Directions forwarded on confirmation of booking.